One night in the life of a working trio playing "classic jazz" - play the melody, improvise, tell a story, and make it swing. "Jazz Life" represents one night in the life of a working jazz trio. It is a "live" recording. There are no edits or tweaks. What you hear is what we played on June 10, 2010 at Cleopatra's Needle in New York City. We hope you enjoy our efforts. 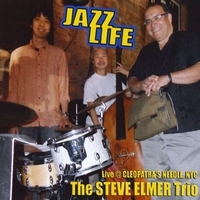 The Steve Elmer Trio began playing together in 2005. Our first CD was recorded in 2006 and is called "I Used To Be Anonymous." In 2007 we spent three weeks performing all over Japan. We recorded "Fire Down Below," our second CD, in 2008. "Jazz Life" is our first live recording. All of our CDs feature original Steve Elmer compositions and straight ahead jazz solos. We like to call this Classic Jazz: play the melody, improvise, tell a story, and make it swing. Browsin' 'ol Steve's good notes! Good mix of easy listnin' and cool jazz.